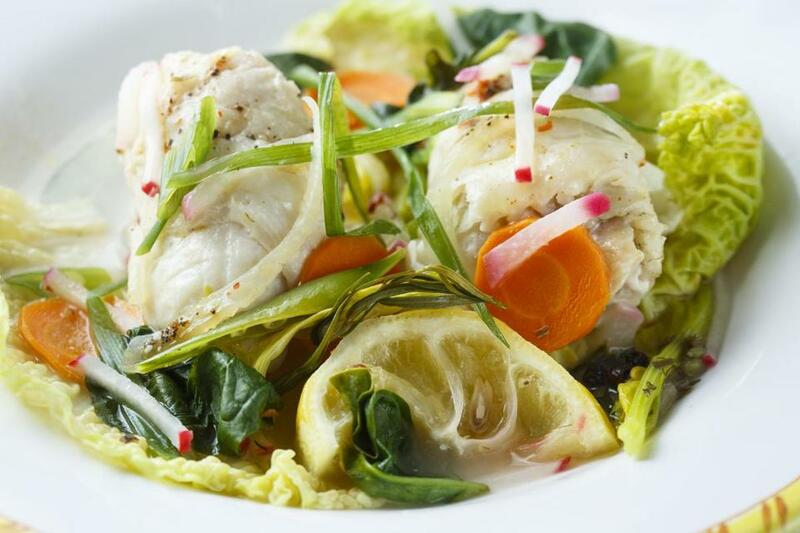 Bamboo-steamed flounder with spring vegetables and basil by chef Gordon Hamersley. 1. Have on hand 2 10-inch bamboo or other steamers. Rinse the bamboo steamers before using. Line 2 8-inch heatproof saucers or shallow bowls with 2 cabbage leaves each. 2. Fold each fillet into a loose roll and divide between the 2 saucers, placing the fish on top of the cabbage leaves. 3. 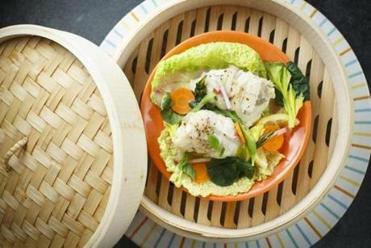 Place the carrots, fennel, peas, celery, celery leaves, radish, basil, tarragon sprigs, scallions, and spinach around and on top of the flounder rolls, dividing evenly between the 2 saucers. 4. Sprinkle with red pepper flakes and salt. Place the lemon slices around the fish, 2 per saucer, and pour the white wine evenly over the fish. Place one saucer in each steamer and cover. 5. Fill 2 14-inch saute pans with about 2 inches of water and bring to a boil. Place the bamboo steamers inside the saute pans. Cook over medium-high heat for 7-10 minutes or until the flounder is tender when pierced with the tip of a small paring knife. You may need to add a little more water if it evaporates too quickly. The method works well with fish like flounder. 6. Turn off the heat and wait for 30 seconds to let the steam subside. Remove steamer covers. Using a kitchen towel, lift the saucers from the steamers.